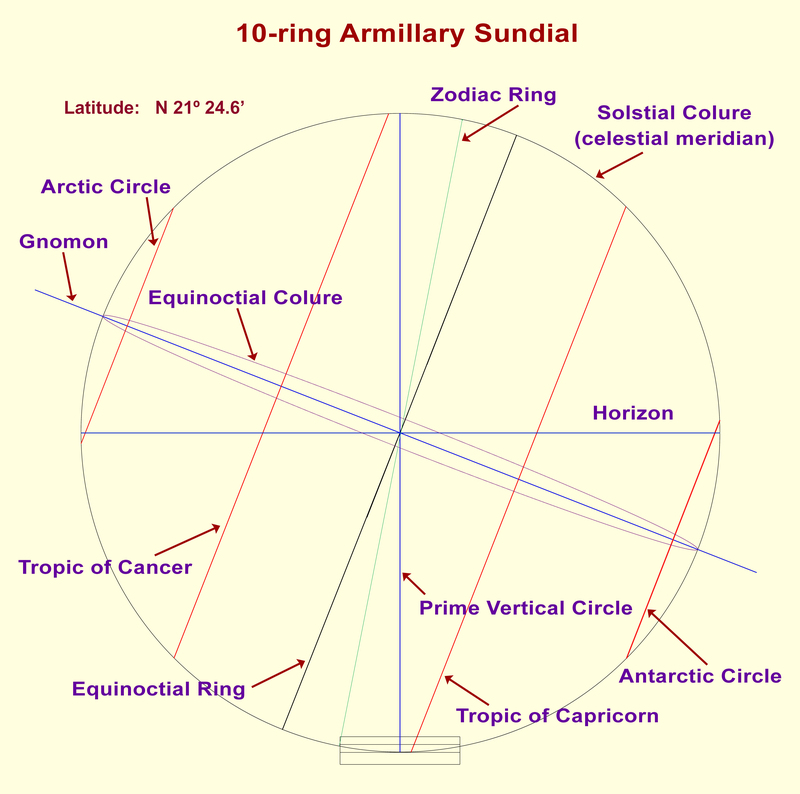 The gnomon is the rod that forms the polar axis of the armillary sundial. Its shadow falls onto the inner surface of the Equinoctial Ring (equator) upon which are inscribed the hours. 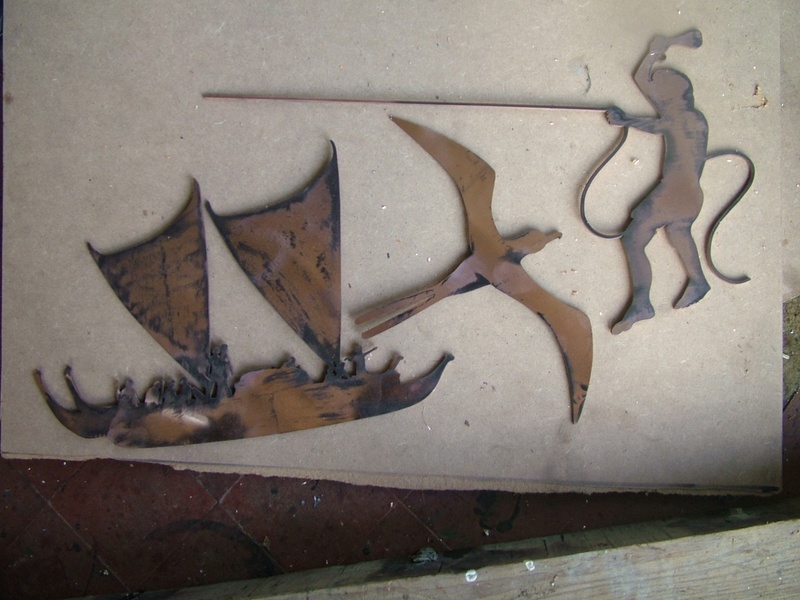 Gnomon comes from a Greek word that means "to know or examine." This is also the root of the English word "know". The gnomon is inclined at the same angle as the latitude of the sundial's location, in this case, 21o 25'. 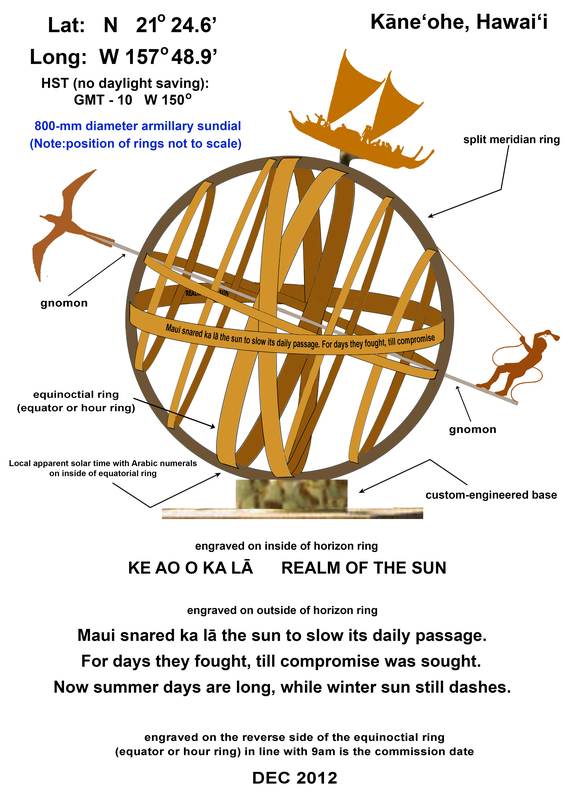 Māui snared ka lā the sun to slow its daily passage. For days they fought, till compromise was sought. Now summer days are long, while winter sun still dashes. • ‘Iwa —the long-winged, forked-tailed frigate or man-of-war bird — positioned at the front of the gnomon. With a wing span up to 6 feet, the ‘iwa can glide on updrafts for days — and typically never stray more than 50 miles from its home island. Sighting an ‘iwa on the open sea is a wayfinding cue to a nearby island. 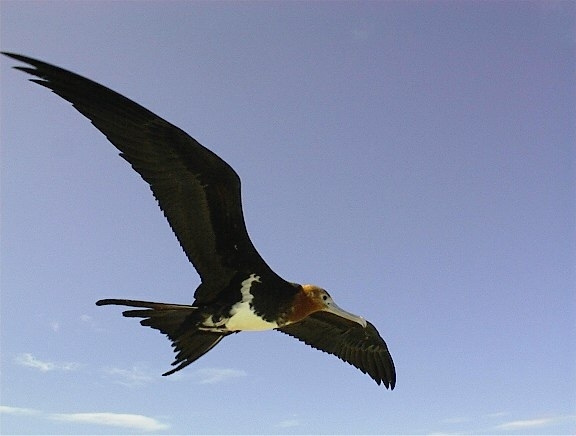 One Hawaiian proverb states: Lele ka ‘iwa malie kai ko‘o — When the frigate bird flies out to sea, the rough sea will grow calm. 1. the sundial is not in the middle of its 15o-wide time zone. 2. the earth travels along an elliptical orbit — speeding up when it nears the sun (around January) and slows down when it's farthest from the sun (around July). 3. since the Earth's axis is tilted to its orbit, the Sun's apparent motion along this inclined ecliptic has a varying effect when viewed along the equatorial plane that clocks are reckoned by. 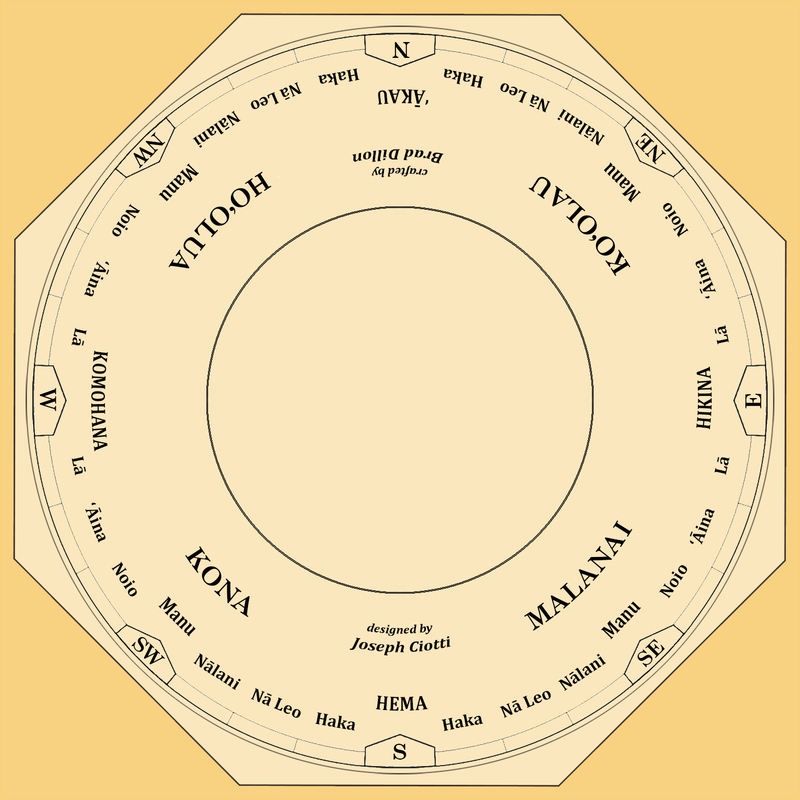 The Hawaii Time Zone is centered at longitude W 150o — and technically extends from W 157o 30' to W 142o 30'. At a longitude of W 157o 49', both Honolulu and Kāne‘ohe (island O‘ahu) are technically outside this time zone. This coupled with the seasonal orbital correction means that Local (watch) Time on Oahu is always ahead of Apparent Solar (sundial) Time. As a result, Local (watch) Time in Hawaii is always ahead of Apparent Solar (sundial) Time. For this reason, Hawaii does not observe Daylight Saving Time, since it technically is on perpetual dayling saving time. 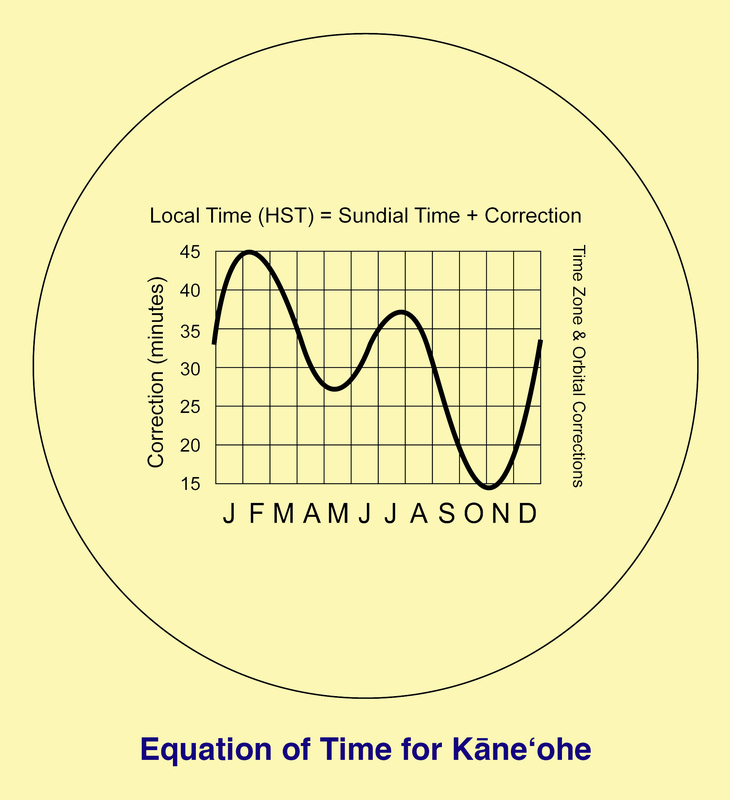 According to the EOT for Kāne‘ohe, Local (watch) Time runs between 15 and 45 minutes ahead of Apparent Solar (sundial) time. EXAMPLE: on July 1, the Correction is 35 minutes. Thus, if the sundial reads 9:10 am, add this correction of 35 minutes to the sundial time to obtain the Local (watch) time of 9:45 am.